But it’s not only the front wheels to worry about- rear wheels can be out of alignment too. 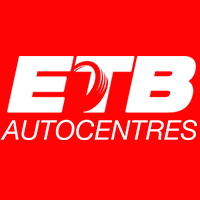 As well as better fuel economy and smoother handling, correct wheel alignment will reduce the wear and tear on your vehicle and extend the life of your tyres. With all four wheels correctly aligned, your car will be safer on the road and easier on your pocket. Wheel alignment should always be checked by an expert. Symptoms of incorrect alignment can be hard to detect but can include your car pulling to one side when you’re driving, or irregular wear appearing across the width of your tyres. 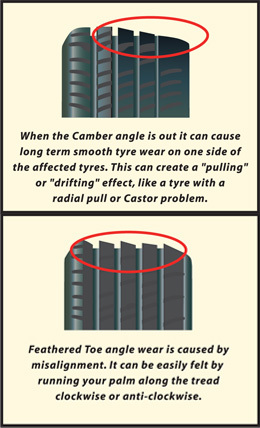 The irregular wear is caused by the tyres not running correctly relative to the road surface. Wheel alignment can be affected by hitting the kurb or a large pothole in the road or travelling regularly on gravel roads. If alignment in out, it can cause excessive wear to your tyres and problems with steering or suspension. The modern car is built for comfort, performance and handling . In order to achieve and maintain the best ride possible, the steering and suspension needs to be measured and adjusted within the motor manufacturer’s specifications. This can only be done by measuring all four wheels and having a proper full four wheel alignment measurement. Call into any of our stores to have your wheel alignment checked.